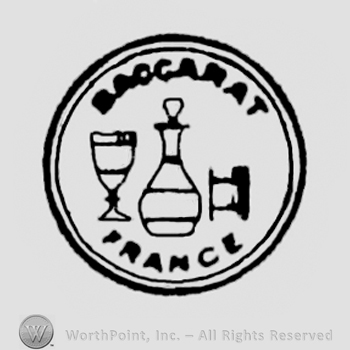 Baccarat’s first mark, which appeared on perfume bottles in the 1920s, showed a carafe, goblet and wine glass. Baccarat has built a worldwide reputation for making perfume bottles, barware, quality stemware and chandeliers. Baccarat has a history dating back to the early years of the 19th century, beginning with the production of crystal in 1816. Prior to that time, the company’s main production was mirrors and window panes. Baccarat received its first royal commission in 1823, the first of a long line of commissions for royal families, politicians, the famous and the infamous. Even though Baccarat won its first gold medal at the World’s Fair in Paris, making an excellent market opportunity, it did not use a registered trademark until 1860. The first was a label usually found on the base depicting a wine glass, carafe and goblet with the name of the company in capital letters within a circle. Baccarat began to mark its products with an etched version, first on perfume bottles in the 1920s and later on other glassware circa 1936. 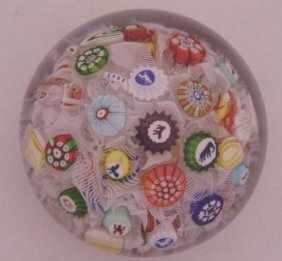 However, Baccarat did mark some pieces earlier that that—their now famous Millefiori paperweights, circa 1846-49. Millefiori is a combination of two Italian words “mille,” which means “thousand,” and “fiori,” meaning “flowers.” Millefiori paperweights were made by fusing multiple colored glass rods together, and when viewed from the end of the bundle, they resemble flowers. On these particular pieces, the Baccarat mark was within the design itself, using the letter “B” and the year made. It was after Second World War that the North American general public became more aware of glassware by Baccarat when the company expanded its line of production of more domestic items. This Baccarat ashtray may have sold new for hundreds, or even thousands, of dollars, but today pieces like it sell for less than $100. Baccarat caters to the high-end market though, routinely issuing limited-run designer pieces with very high retail values that often don’t hold up very well in the secondary market. Even more than 20 years later, values at auction tend not to reach back to discounts offered on their original manufacturer-suggested retail price. 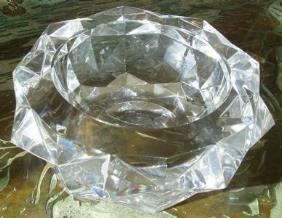 The piece pictured is a more modern example: a Baccarat ashtray. Currently new ashtrays and trinket trays retail prices start at $240 and climb to more than $1,100. But pieces like the one pictured often sell at auction for less than $100.